FAQ about Axis Deer/Formal Paper about Axis Deer – compiled by Comanche Spring Ranch. Here are a few delicious deer and antelope species and a bit about them. See some more at our Venison Vendors page. Axis Deer. This native of India is most valued for its exotic trophy antlers, beautiful, spotted hide, and delicious venison meat which is similar to fine veal but lower in fat and cholesterol. Axis are found in the USA in Texas, Florida, and Hawaii in great numbers. Blackbuck Antelope. Also found in great numbers in Texas, USA, this native of India is a beautiful antelope using colors of black, fawn gold, and white. The females and young males are always fawn and white. The male (hence the name) gets more black on his back as he gets older. Trophy horns on this antelope are over 21″. Legend has it that Indian maharajas would have champion fighting Blackbucks and this was a great diversion on lazy afternoons. 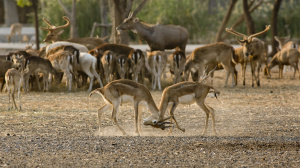 The winning Blackbuck would wear jeweled necklaces and a purple velvet cape. Blackbuck are small so each one doesn’t provide many pounds of venison, but it is delicious and well worth a looking for. Scimitar Horned Oryx (SHO). Native of the dry country of Chad in Africa (but now extinct there). These large white, royal antelope offer curved, razor sharp horns in both sexes. 43″ is a very nice trophy. Legend has it that the myth of the Unicorn comes from this beautiful animal whose curved horns, at a distance, could look like one horn and whose body, particularly in motion, looks very horse-like. Manchurian Sika Deer. Native of China and Manchuria, these small, elk-like deer are a staple in the Orient and becoming more available in the USA. However, they’ve had an uphill battle to find homes in our NW states where people want to farm them but are having to fight local legislation – personalities and issues. Sika venison is stronger flavored so find just the right recipe to enhance its nice attributes. Fallow Deer. This native of Europe is known as the trophy of kings. It has large palmated antlers in October-March. Most older European venison recipes are based on the flavors of the Fallow Deer. The Fallow comes in several colors, all with spots: dark chocolate brown, light brown, white. Barasingha Deer. This deer is an endangered species of India. It is larger than an Axis and smaller than an elk. In the spring it is a lovely orange-brown color, otherwise, brown. It has large Mickey Mouse ears and a sweet face. Before it went on the Endangered Species List, it was known for its delicious venison meat. It is reproducing well in places like Texas but ranchers cannot afford to stock many because, due to the List, they are difficult to buy and sell. There is a movement to take species off the Endangered Species List if they are reproducing well in a non-native country. Allowing venison meat producing herds would assure the Barasingha of not going extinct…that’s why we have so many cattle today! Allowing trophy hunting would provide a kindly exit for the old males and their antlers are relatively large and very, very heavy compared to other deer. Whitetail Deer and Mule Deer. These natives of North, Central and South America are very prolific, more than at any time of recorded history. When the sheep men eliminated the screwworm, it allowed the survival of many more native deer. They are becoming pests in many parts of their world. Seasons need to be extended and more harvesting allowed both for the sake of the animal and for people. 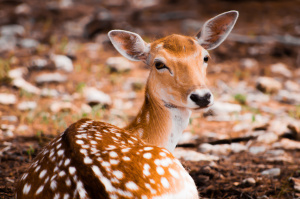 These deer tend to cycle…they reproduce until their food supply cannot support them and then in one season, most of the deer will get diseased and starve and die. Did you know?…Whitetail deer kill more people every year than any other wild animal?